In the indexable tool industry (that is, industrial cutters), a product family called "Cermets" have been in use for the past three decades. Rooted in the words ceramic and metal, "Cermets" is a word with which the woodworking industry will become very familiar in the next few years, as this technology seeks to replace traditional carbide tipped blades. According to Tom Walz of Carbide Processors Inc., in Tacoma, Washington, the new generation of Cermets-tipped blades takes a sharper edge, cuts cleaner, runs quieter and stays cooler than traditional blades. But one of the most exciting aspects of ceramics in saw blades is that workpieces - especially hardwoods - can be fed through them much faster than a saw equipped with a traditional carbide blade. You can crank up the stock feeder, which is a real boon to cabinetmakers, custom flooring manufacturers, or indeed anyone making repititive rip cuts for products like paneling, siding and trim. And moving up to Cermets-tipped blades doesn't require a huge investment, either. Because a Cermets-tipped blade can handle high temperatures better than has ever been possible before, sharpenings are few and far between. (See chart at right.) That alone might justify the extra cost. Add to that the fact that these blades are industrial rather than consumer grade, and among the best built cutters in the world even before the Cermets is added, and moving to ceramics suddenly seems like a very sensible decision. There is one drawback to Cermets, but it's something which will soon correct itself. Offering Cermets to the consumer and small pro markets is a new direction for the industry, so each and every blade is essentially a custom job. That means that there is a lead time between the time you buy and pay for a new blade, and the time it's delivered to your shop. That's not really a problem for hobbyists, but it might be a little frustrating to a production shop that wants to make the leap to ceramics right away. As demand grows and the batches get bigger, this problem will dissolve, just like it did with carbide tipped blades when they were introduced to a mass market some thirty years ago. C-4 carbide was a very valuable material during World War II. It was originally designed to deliver fine finishes in steel, where corrosion was a problem. It has been sixty years since the U.S. Army and Buick created C-4, although it took several years after that to find its way into home workshops. Traditional carbide grades are conglomerate materials, where the tungsten carbide grains are cemented together with cobalt. This is like pouring concrete. Cermets tips are chemically bound into a single piece, instead of being a composite of cemented grains, so they resist fatigue, adhesion and fractures much better. They are five times more corrosion resistant than ordinary tungsten carbide. All of that together means tha a Cermets-tipped blade stays sharper much, much longer, and is much harder to break. True Cermets (TiCN / NiCr) are actually solid chunks of the same materials that are used as a coating on ordinary grades of carbide, to make them more wear resistant. 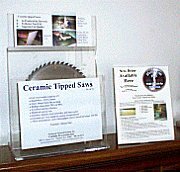 Whittier Wood Products in Oregon ran an independent test of ceramic tipped saws, where cermets-tipped blades were tested against carbide-tipped ones. The Cermets-tipped blades stayed sharper much longer, as expected. But what was a bigger benefit was that the cuts were much cleaner (the carbide cut at left in the photos below, with Cermets at the right), thereby significantly reducing the amount of work necessary after cutting. Traditionally, brazing has been just a means to hold the saw tip on the steel saw body. The new Cermets-tipped blades from Carbide Processors use a carefully designed brazing process that holds the tip with much greater tensile strength, as well as creating a suspension effect. (It's like driving a car with a good suspension.) Then, the tips are ground with 600 grit wheels impregnated with man-made diamonds, and each tip is ground within 0.0005" (one half of one thousandth of an inch). Cermets and ceramics have replaced standard tungsten carbide in about 60% of all metalworking applications. 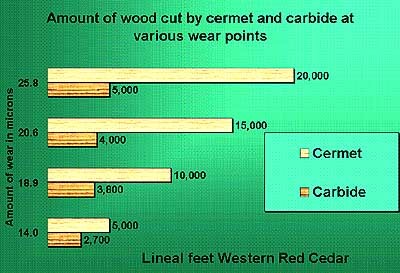 Carbide came to woodworking from metalworking, a journey which is now being repeated by Cermets and ceramics.